Raymond Bourque, a model of proficiency and consistency at an elite level throughout his career, was born in Montreal, Quebec on December 28, 1960. Inspired by the firewagon offense and oppressive defense of his hometown Canadiens through the dynastic seventies, Ray climbed the rungs of minor hockey, joining the Sorel Eperviers of the Quebec Major Junior Hockey League in 1976 at the age of sixteen. After a final freshman campaign, the franchise moved from Sorel to Verdun, and Bourque kicked his career into an entirely new gear. In 1977-78, Bourque scored 22 goals and added 57 assists and was subsequently named to the First All-Star Team in the Quebec Major Junior Hockey League. 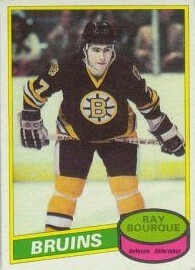 The next season, 1978-79, Bourque repeated his All-Star status, but increased his offensive output with 93 points. After three sterling junior seasons that merely hinted at the incredible potential held by the under-aged defenseman, Raymond Bourque was chosen by the Boston Bruins with their first selection, eighth overall, in the NHL's 1979 Entry Draft. That fall, Bourque made his NHL debut amidst the accolades of teammates, media and opponents. Quietly, methodically, Raymond dazzled, racking up 65 points; the most for a rookie defenseman in NHL history up to that time. He was the obvious choice for the Calder Trophy as the NHL's Rookie of the Year and also earned selection to the NHL's First All-Star Team; the first non-goaltender to win both honours in the same season. Bourque consistently provided leadership from his spot on the Boston blueline. Through twenty seasons with the Bruins, twelve as team captain, Bourque dominated, earning 17 selections to NHL All-Star Teams. He was a five-time recipient of the Norris Trophy as the NHL's best defenseman. Only Bobby Orr with eight and Doug Harvey with seven have earned more. Bourque enjoyed a career season in 1983-84. His 31 goal output was a career high, and his 96 points were not only a career best, but led all defensemen that season. Wearing jersey number 7 through his first eight seasons with Boston, Bourque surrendered that number in December 1987 when the Bruins honoured Phil Esposito. At centre ice in front of Esposito and the Boston faithful, Raymond removed his jersey to reveal a second Bruins' sweater -- this one numbered 77. Esposito's number could be retired and Bourque initiated wearing a number that he quickly established as uniquely his own in Boston. Yet, in spite of all the personal accolades, the one achievement that had eluded Ray was hockey's ultimate team award -- the Stanley Cup. Although Boston had twice reached the final (1988 and 1990), the prize had eluded Bourque and the boys in Boston both times. When the opportunity arose to join the Colorado Avalanche at the trading deadline in March 2000, Bourque deliberated, then decided to join the Stanley Cup contenders. Although Colorado wasn't successful in achieving its goal that first season, in 2000-2001, a pursuit Ray labeled 'Mission 16 W', the Colorado Avalanche made Bourque's dream a reality when the team was crowned Stanley Cup champions in 2001. It had taken twenty-two seasons, but Raymond Bourque had finally achieved his lifelong hockey goal. That summer, he retired. Nothing like going out on top! During an extraordinary NHL career, Ray Bourque collected 410 goals and 1,169 assists for 1,579 points in 1,612 regular season games. He retired as the most proficient scoring defenseman in NHL history. In 214 playoff contests, Bourque added 180 points on 41 goals and 139 assists. Ray played in nineteen consecutive NHL All-Star games, surpassing Wayne Gretzky for the league record, earned the King Clancy Trophy in 1992 for his on and off ice contributions to the game and represented Canada in three Canada Cup tournaments (1981, '84 and '87). In addition, Bourque participated in the 1998 Winter Olympics in Nagano Japan, representing Canada. In honour of his great contributions to hockey, both the Boston Bruins and Colorado Avalanche retired Ray's #77 jersey. 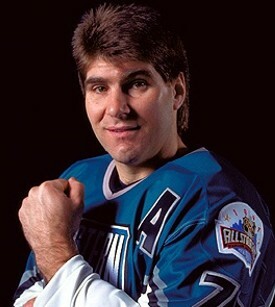 In 2004, Ray Bourque was selected to join hockey's elite in the Hockey Hall of Fame in his first year of eligibility. "I was hoping to get the call, but when it came, I was completely speechless," said Bourque after receiving notification of his election to the Hall. "When I started out playing in the NHL, my goal was simply to establish myself as a player and I never contemplated this type of honour." Scotty Bowman, an Honoured Member of hockey's Hall of Fame, stated, "He was a two-way player and he was so durable. He seldom got injured even though he played more than half the game. He played on some good teams in Boston because he made them good." In the November 2004 Hockey News article, Bowman continued, "I always felt Bourque was very similar to (Denis) Potvin. Both were great passers, had a terrific feel for the game and they were strong. Nobody ever would push them around." Hockey Cards, Game Worn Jerseys and Equipment, Hockey Collectibles, Pocket Schedules and more! Hockey Card Companies: Topps, eTopps, OPC, O-Pee-Chee, Parkhurst, Beehive, Upper Deck and more!! !